Undefeated bantamweight prospect Sean O’Malley may have a bright future in the Ultimate Fighting Championship, but before he returns to the Octagon, he’ll need to tend to his left foot and hand. Nicco Montano is the Ultimate Fighting Championship’s inaugural women’s flyweight titlist and she’s officially $ 100,000 richer now, too. Last Friday night (Dec. 1, 2017), Nicco Montano was able to outlast longtime veteran Roxanne Modafferi to capture the newly minted Flyweight title at The Ultimate Fighter (TUF) 26 Finale in Paradise Theater in Las Vegas, Nevada. The main point of TUF 26 was to anoint a champion, and now we have one. The other point was to introduce a number of recognizable names to the division, which is a goal somewhat accomplished, as many of the TUF 26 veterans will be in the UFC for years to come considering how young their professional careers are. However, there’s a lot of risk for the new champion. Following The Ultimate Fighter season 20, Carla Esparza ran through her competition pretty thoroughly to capture the belt. Then, a relatively unknown up-and-comer — some Polish kickboxer with a weird last name — stepped up as her first title defense, only to utterly dominate the TUF champion. Could that happen again? Very possibly, so let’s take a look at a few of the threats to the new champion. Why is VanZant a title threat? It’s easy to write “PVZ” off right now. She hasn’t fought in about a year, a main event loss to “Karate Hottie” Michelle Waterson. In the mean time, VanZant has been busier writing memoirs and appearing on Chopped than actually competing in the cage. She was supposed to face Jessica Eye back at UFC 216, but injuries scrapped that bout. Then, VanZant awarded herself a title shot on Twitter. Some of the above is ridiculous, but most of it doesn’t really matter. The real bottom line here is that VanZant is still a 23 year old prospect with some quality wins on her record. Additionally, she’s spent the better part of the year training consistently, which is exactly what the up-and-comer needs. VanZant is made for five round fights, and if she can up the technical side of her game, she’s a threat in this division. Why is Rose-Clark a title threat? Rose-Clark stepped up on very short-notice just last month to face Bec Rawlings. It was her first official bout at 125 lbs., and Rose-Clark did miss weight. However, she looks the correct size for the division — she doesn’t appear to be a Bantamweight killing herself for a size advantage — so hopefully her weight won’t be an issue moving forward. Currently, that’s the biggest obstacle to viewing Rose-Clark as a legitimate title challenger. Otherwise, the Aussie showed a number of great skills in her debut. Rawlings is a forward pressure boxer with solid hands for her division, but Rose-Clark made her look like an amateur at times. Utilizing great footwork, counter punches, and a surprisingly sound grappling game, Rose-Clark picked her opponent apart cleanly. The split-decision call was nonsense, but that’s the game. Rose-Clark faces off with VanZant on January 14 at UFC Fight Night 124 in a bout that could determine the next title challenger. Why is Eubanks a title threat? That’s a complicated question. Eubanks performed extremely well on TUF. As the No. 12-ranked seed, Eubanks finished the fourth and fifth ranked opponents before dethroning the favorite, last night’s title challenger Roxanne Modafferi. She was the original woman matched up with Nicco Montano, and the odds were quite even ahead of that match up. Unfortunately, the inability to make weight cost Eubanks her golden opportunity at the title. Worse still, Eubanks didn’t just miss weight, she was hospitalized after her disastrous cut. This week could be the end of Eubanks’ Flyweight career, and that would be a reasonable call from the UFC. At the same time, Eubanks did make weight three times on TUF, which is a far harder task than doing it once. If she can manage to again in the future, she’s immediately in the title mix. She was supposed to fight Montano in the first place, after all. Keys to Victory: Most of these picks — especially the upcoming top pick — are not really surprises, but Chookagian is my pick for the best dark horse at 125 lbs. 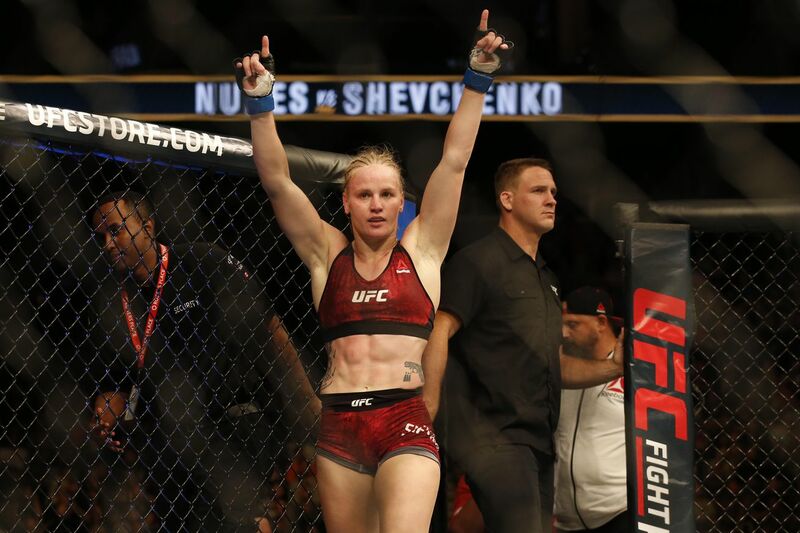 “Blondefighter” may be a terrible nickname, but the Chookagian has earned a 3-1 record at Bantamweight against some pretty solid competition. Three years into her pro career at 28 years old, the former Flyweight has a ton of potential that has yet to be tapped. Perhaps the most impressive thing about Chookagian is her fight camp. Chookagian is one of the staple members of Mark Henry’s fight team in New Jersey, which means she trains with top-tier lighter weight fighters like Frankie Edgar, Marlon Moraes, and Edson Barboza. Her fighting style represents her team extremely well. Chookagian moves wonderfully, circling the cage and firing good strikes from range, maintaining that constant activity that her team is known for. It’s a great style that makes her difficult to take down, although wrestling is still an area that Chookagian occasionally shows her inexperience. Keep an eye on her moving forward. Why is Shevchenko a title threat? Because she’s the most technical fighter in women’s MMA. This one is obvious. Shevchenko is coming off a split-decision loss to Bantamweight queen Amanda Nunes, a decision that very easily could have gone her way. She fought most of her extensive Muay Thai career below 135 lbs., and she can reportedly make Flyweight with no issues. If that’s true, “Bullet’s” championship reign is imminent, and many more noses will be made rose. Shevchenko is a masterful counter striker who provides her opponent with very few opportunities. Recently, her offensive grappling and defensive wrestling have come a long way as well. A training partner of current Strawweight champion Rose Namajunas, it’s hard not to see Shevchenko will gold wrapped around her waist at some point soon. Honorable Mention: The former Strawweight queen Joanna Jedrzejczyk would absolutely be on this list if not for the fact that her current focus is a rematch with Rose Namajunas. Otherwise, Jedrzejczyk found great success at 125 lbs. as a kickboxer, and she certainly has the skills to piece up some women with an extra 10 lbs. on her frame. There you have it. Are there any other major Flyweight title threats that I missed the mark on? Someone on my list that doesn’t deserve to be there? Let’s hear it in the comment’s section. The post TUF 26 Finale Results: Nicco Montano Defeats Roxanne Modafferi, Earns 125-Pound Belt appeared first on Caged Insider.